Before You book a guided fishing trip with me, there are some things I would like You to notice. 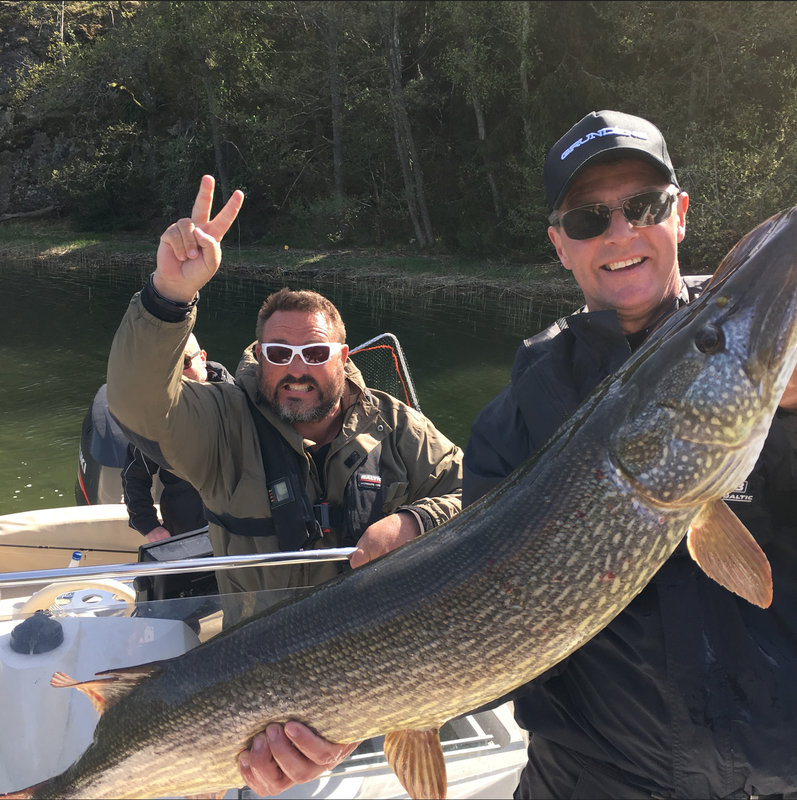 How to book a guided fishing trip: In case You are interested in me guiding You on some serious fishing here in Sweden, I’ll be happy to take You out on a fishing trip You will never forget. First though, please read the information below and then email me or call me on my cellphone, and we’ll take it from there. This is included: I arrange with boat, gas, skipping and guiding, flotation suits and/or vests, fishing gear and tackle and of course instructions on how to catch the big one. As for Your food and drinks, I arrange with it according to Your wishes. Full day: The price for a full days guided fishing, sightseeing and/or sunbathing trip (maximum eight hours) in the Stockholm archipelago is totally 7 000 sek 6% tax excluded for 1-4 persons, and then 1 750 sek 6% tax excluded extra per person up to maximum six persons. In case You are more anglers than six, I just call my collegues in. The terms and prices for them are the same as mine. 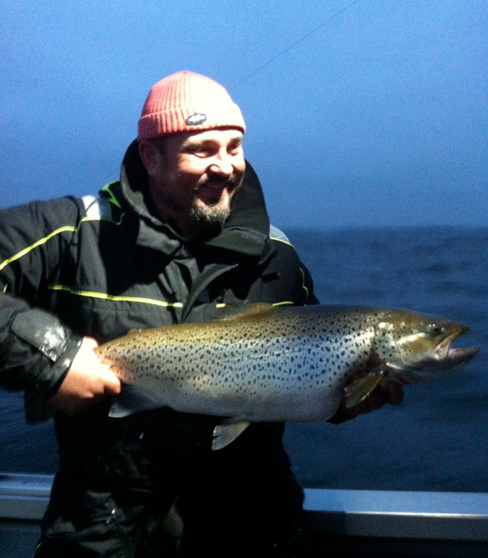 Half day: The price for a half days guided fishing trip (maximum four hours, morning or afternoon) in the Stockholm archipelago is totally 5 800 sek 6% tax excluded for 1-4 persons, and then 1 450 sek 6% tax excluded extra per person up to maximum six persons. In case You are more anglers than six, I just call my collegues in. The terms and prices for them are the same as mine. Others: I also offer other alternatives, such as special deals for bachelor parties or youth, or customized sollutions according to Your wishes, so please don’t hesitate to call or mail me if You’re interested. 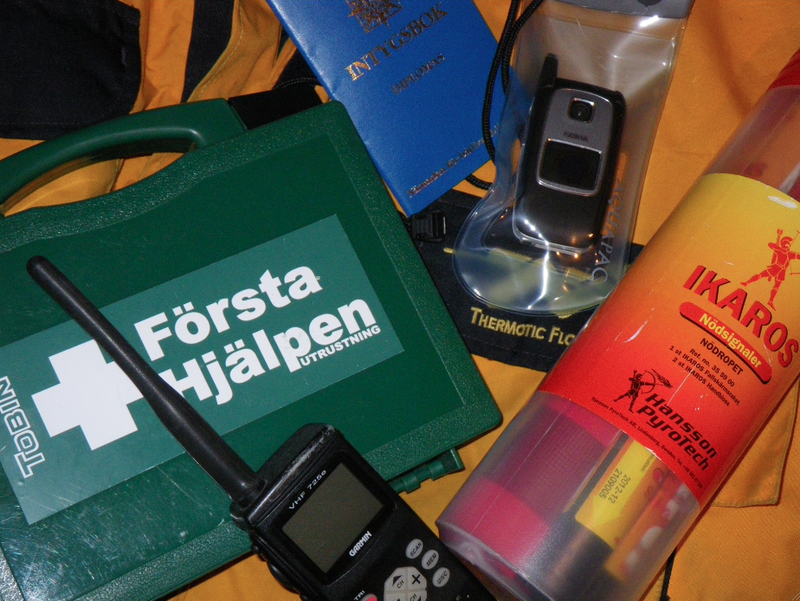 Pickup and drop off: Preferably I pick You up in Vaxholms port about 30km’s northeast from Stockholm City. You can take the ferry from downtown to Vaxholm t/r. It’s cheap and takes about an hour, single trip. If needed though, I can also pick You up and drop You off downtown in Stockholm City if You prefer that. Either by car or by boat. Please note that if pickup and/or drop off is to be done far away from my home port, an extra fee is normally added on the price. Of course I will let You know this before I confirm the booking. As for time for pickup and drop off, we decide this together when You book the trip. Please note though, that I always need to be able to get back to my homeport before it gets dark. Guided icefishing: If You never experienced icefishing, You have to give me the chance to show You how joyful and exciting it can be. The best icefishing in the Stockholm archipelago is for Pike and Pikeperch, and it’s done by using a special kind of short ice-angling rod rigged with a multiplier reel and tackled with baitfish. Many times this is the method that catches the biggest Swedish Pikes every year. 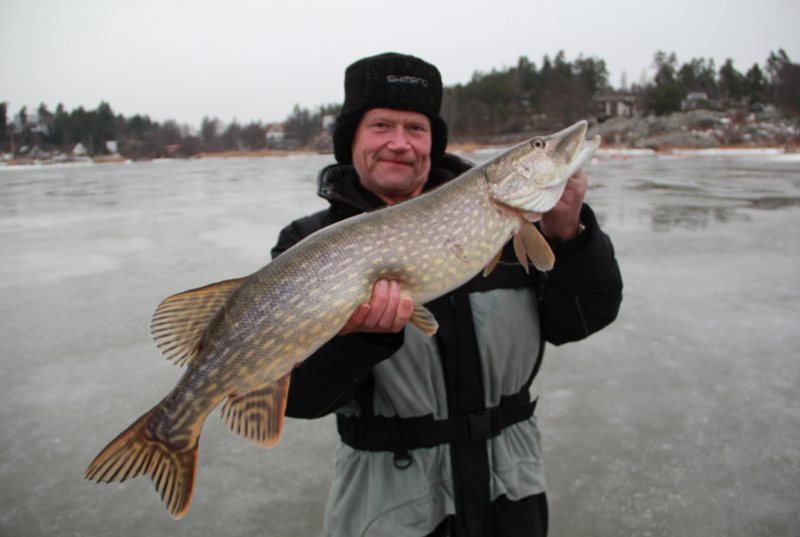 The price for a full days guided icefishing (maximum four hours) is 4 500 sek, tax included, maximum ten persons. In case You are more than ten persons, I just call my collegues in. The terms and prices for them are the same as mine. When icefishing, the easiest way for us to get started is either if You come to me by car, and then we drive together from our meeting point to where we’re fishing. Or I can pick You up by car downtown and take You back there when we’re done. If You’re maximum four persons that is. As for time and place for pickup and drop off etc, we decide this together when You book the trip. 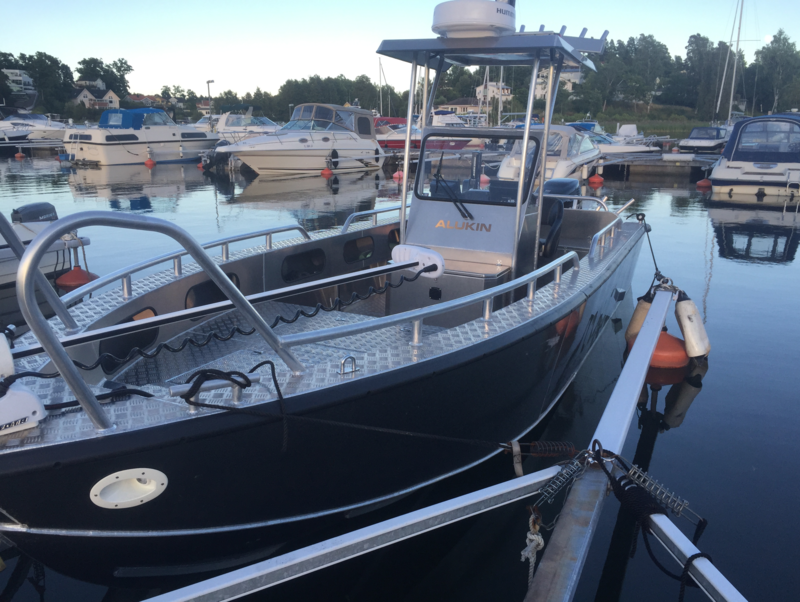 The boat we’re fishing from is a brand new, seaworthy and comfortable Alukin Pro Fishing 750 with a quiet and fuel saving but powerful Suzuki DF250 outboard as main engine and an 112lb electronic MinnKota Riptide engine as an extra emergency engine. The boat is equipped with twin Humminbird plotters with eco sounder, radar, autopilot, a stationary VHF radio, digital and magnetic compasses, stereoe, an extra handcarried GPS, an extra handcarried VHF, a McMurdo Fastfind PLB and paper sea charts and manual navigation equipment etc. Aboard there is of course all necessary security gear, such as Baltic flotation suits/vests, water protected cellphones, lifeline, First aid kit, ABC fire extinguisher and flares etc. The tackle and fishing gear we use is always state of the art equipment, ready to serve You in our attemt to catch the big one. Experience, education and certificates: As a skipper with paying customers aboard, it’s my responsibility to see to that I’m educated and certified according to what the law and Your security demands, which I of course am. Except for a lifetime on water, I’m a certified Coast skipper, certified skipper Class VIII, certified Fast ship skipper, certified Radar skipper and a certified user of VHF radio. Insurance: To make sure we’re all protected in all ways, I have an insurance that covers most possible situations, except for injuries caused by a careless passenger. Then the passengers own insurance must cover the possible injury. Please note though, that I have never had any accident on my boat, and I intend to see to that it stays that way. Catch & release: Finally I would like You to notice that You don’t go fishing with me to fill Your fridge. Quite the opposite actually. 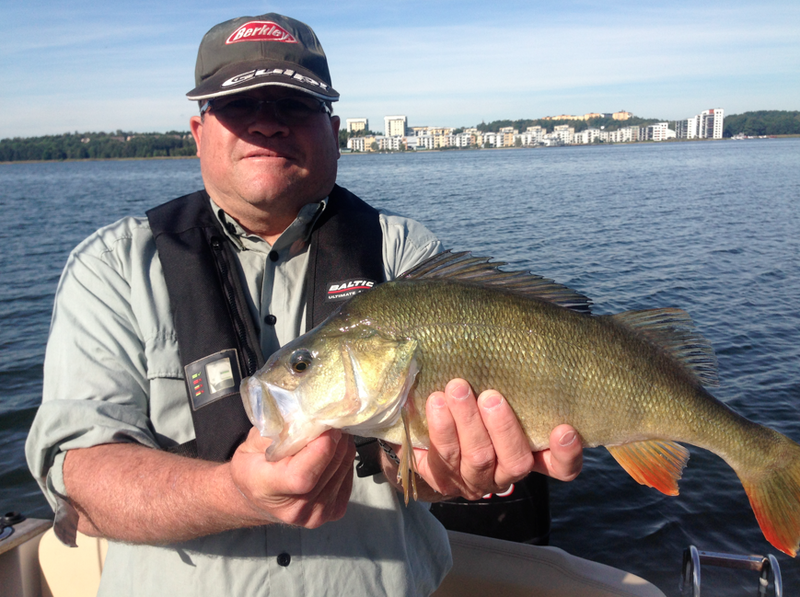 The point with a guided fishing trip with me is to enjoy our beautiful archipelago and to learn how to catch the big ones here in Stockholm. To make this possible both for us and for future anglers, in most cases we practice catch & release in my boat. After all, we do this mainly for fun, not for food.